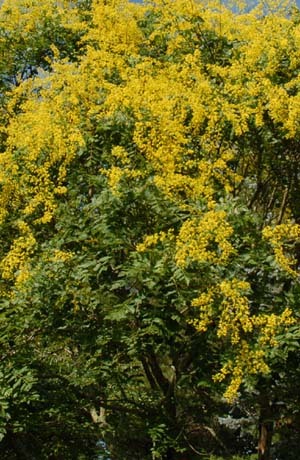 Golden Rain Tree (Koelreuteria), also known as Varnish Tree, is a large tree to 40 feet, with large clusters of yellow blooms through the summer, followed by large clusters of salmon pink seed pods. This is a beautiful tree, but it's one of my least favorites because of a bad experience. This is caused by the ingeniously designed seed pods that are like small paper lanterns with the seed attached to one side of the paper thin walls. The lanterns take off in the wind, floating around until they land somewhere they can snag onto something solid. This makes them very invasive in my opinion. 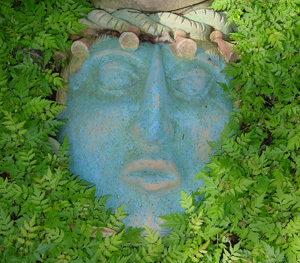 My former neighbor had a full grown tree that constantly littered my garden with what soon became seedlings so thick that they looked like some sort of ground cover. Every year I had to spend days pulling each seedling by hand. 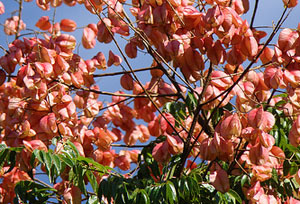 It's considered to be invasive in many areas. This, coupled with seasonal infestations on my house walls of the red and black Jadera bug that are drawn to this tree are enough reasons for me to avoid this tree.